The Federal Reserve charges what’s known as the federal funds rate. That’s the rate the banks must pay to borrow money. When banks loan that money to consumers and businesses, they mark up the federal funds rate. This mark up allows the banks to earn a profit. However, banks generally have a percentage markup. Therefore, their overall profits from loans are heavily reliant on the Federal Reserve’s rate. Think about it, let’s say that the banks mark up the Federal Reserve’s rate by an average of 1,000%. Currently, the Federal Reserve’s rate is 0.25%. Therefore, at the fictitious mark up above, the banks would charge 2.50%; leaving the banks 2.25% interest as profit. However, if the Federal Reserve decided to increase it’s rate to 0.75%. Using the same mark up, the banks would charge 7.50%. After paying the Federal Reserve their 0.75%, the bank would keep 6.75% interest as profit. So, when the Federal Reserve’s rate is higher, big banks make far more money on loans. The Big Problem For Banks! The big problem for banks at the moment is that the Federal Reserve’s rate is so low. In fact, the 0.25% rate we’re currently seeing is the lowest in history! However, big banks and their investors were excited by the Federal Reserve’s plans to increase it’s rate by the end of the year. 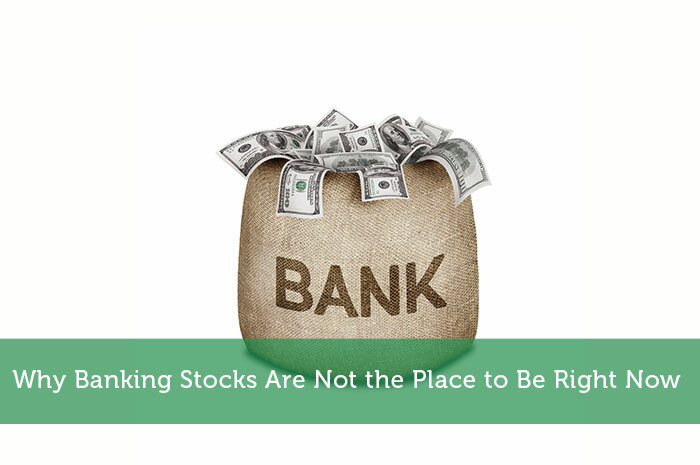 As a result, investors have held bank stock prices higher than they normally would. Now the problem is the fact that it doesn’t seem like the Federal Reserve is likely to raise its rate by the end of the year. The reality is that to raise the rate, the Federal Reserve needs to know that the US economy can withstand the pressure. However, the US economy isn’t looking good. In fact, there are a few major issues with the economy at the moment. First and foremost, consumer spending is a major factor in economic growth. However, consumer spending has been moving at an incredibly slow rate. This puts quite a bit of pressure on the economy. Another major factor is that exports are struggling. Essentially, the United States economy needs money coming in from elsewhere to grow. That happens through exports. However, with the strong US dollar that we’ve been seeing throughout the past year, US products have grown in price abroad. This has caused a decline in demand for these products and put the pressure on US companies. Finally, jobs growth is starting to decline in a big way. As a matter of fact, August and September proved to be a big miss in that sense; and economists aren’t expecting any major improvements in October. As a result of all of these issues, the Fed is not likely to raise it’s rate and big banks are likely going to continue taking in less revenue from loans. So, until this changes, big banks simply aren’t the right place to invest. Where do you think big banks are headed and why? Let us know in the comments below! Joshua Rodriguez is the owner and founder of CNA Finance. He is also a partner here at Modest Money. His analysis has been featured on Investing.com, Yahoo! Finance, Google Finance, Google News, and many others. To connect with Joshua, follow him on Twitter @CNAFinance. What if banks add a fixed amount instead of a percentage of the Federal Fund Rate. For instance, at 0.25%, they simply add 5% markup which, so no matter what the Federal Fund rate, the bank’s profit stays the same. I think that’s how they calculate the market rate in some countries, but not sure about USA. In such cases, banks shares may be a pretty good investment because their income stays stable on loans (provided no bad debts are made). On the flip side, banks are making decent profits even without that income that would potentially be factored in with a rise in interest rates. So, if you really trade based on future earnings, then assuming that rates start to rise in 2016, they could be plenty attractive. I think market sentiment matches your post, though, so while I see banks as an attractive investment, I think there’s room for some downward movement in the short term. It is true that banks often become the first choice of a majority of investors due to the substantial amount of finances they own. However, there is always the downside which is the by being restricted to only the banks, it could also mean your returns are restricted and when they are affected by tough economy, your only source of investment would go down the drain.